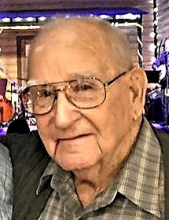 Earl R. Cochran, Sr., 89, of Vidor, died Monday, April 15th 2019. He was born on April 6, 1930, to Ottie and Marie Cochran in Mobile, AL. He worked hard all his life, going to work in a dairy at the early age of 10. When he was 16, he went into the merchant marines. He was a fireman in the U. S. Air Force, serving in Korea. In 1954, Earl married Jo Beth Bledsoe and they had two children. He was a loyal employee to Bowers’ Hardware, National Life Insurance, Coca Cola and Lance, Inc., retiring in 1985 as a branch manager. Upon retiring, he was self-employed, doing tractor work, and making concrete benches that are scattered across the Golden Triangle. During the 1990’s, he served on the Orange County Grand Jury; he was extremely proud of that service. He was also a member of the Vidor Masonic Lodge. Visitation will begin at 6:00 pm Tuesday, April 16, 2019 at Memorial Funeral Home of Vidor. Funeral services will be held at 2:00 pm Wednesday, April 17, 2019 at Memorial Funeral Home with burial to follow at Restlawn Memorial Park in Vidor. Survivors include children, Lynette Busceme and husband, Jim, and Earl Cochran, Jr and wife, Tami; sister, Shirley Ambrose; and grandsons, Matthew Busceme and wife, Lauren, Trey Cochran and Lance Cochran and wife, Hope, and Great Grand Daughter Bristol. He is preceded in death by his parents, Ottie Cochran and Marie Wilson; wife, Jo Beth Cochran; sisters, Bessie Turner, Jessie Turner and Essie Busby; brothers, Leon Cochran and O. J. Cochran; and grandson, Adam Busceme. To send flowers or a remembrance gift to the family of Earl Ray Cochran, Sr, please visit our Tribute Store. "Email Address" would like to share the life celebration of Earl Ray Cochran, Sr. Click on the "link" to go to share a favorite memory or leave a condolence message for the family.